I decided today to order some ASP.NET MVC Books for a project I develope for myself. Many issues are covered out there in the internet but sometimes it's much easier just to open a book and read in it. As a person who spend's lot of time in public transportation I try to use this time to learn and reading books. Since all the books are available only in english I decided to check which amazon store would be cheaper for me and I got surprissed with some facts during my comparsion. amazon.com offers me a free shipping as long as the shipping address is within US. really cool, I'm leaving ins Swiss and after my login they should know that and don't offer me anything like that! amazon.com offers me a package of common books together -> at the amazon.de store they didn't recogniz that I like to buy a bundle of books and they didn't offer me any offers at all. Based on google conversation 133.22 EUR are 186.67 USD - this is quite a lot of money!!! 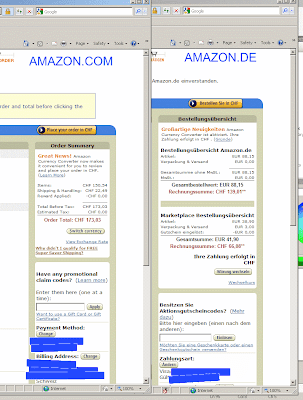 amazon.com and amazon.de both are offer me now to pay my bill in my local currency - based on my credit card payment currency. This save's me some 2.5% fee at my visa provider :-) nice. 32.06 CHF is around 21.10 EURO and around 29.55 USD difference. In terms of global crises I think this is a lot of money and people out there should check where they buy books -> especially technical books which are mostly written only in english. 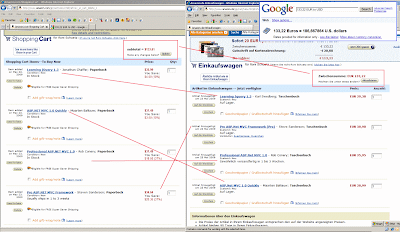 My personal conclusion is quite simple, there is no reason why I should spend my money at amazon.de!